The internet of things. You’ve no doubt heard the term and are probably already immersed without realising it while reading this. It refers to networks of interconnected physical devices, sensors and digital technologies that connect and exchange data. For example, take your mobile phone. You use it to connect to your friends via social media and are reminded that it’s your sister’s birthday tomorrow. You check the weather forecast and realise you won’t need an umbrella today since a heatwave is predicted. You set a reminder on a home energy app to turn on your air-conditioner at home 30 minutes before you are due to arrive. Thus you are connected to the internet of things, where the currency and the connections are all carried in data between objects. Experts estimate that the internet of things will consist of about 30 billion objects by 2020. 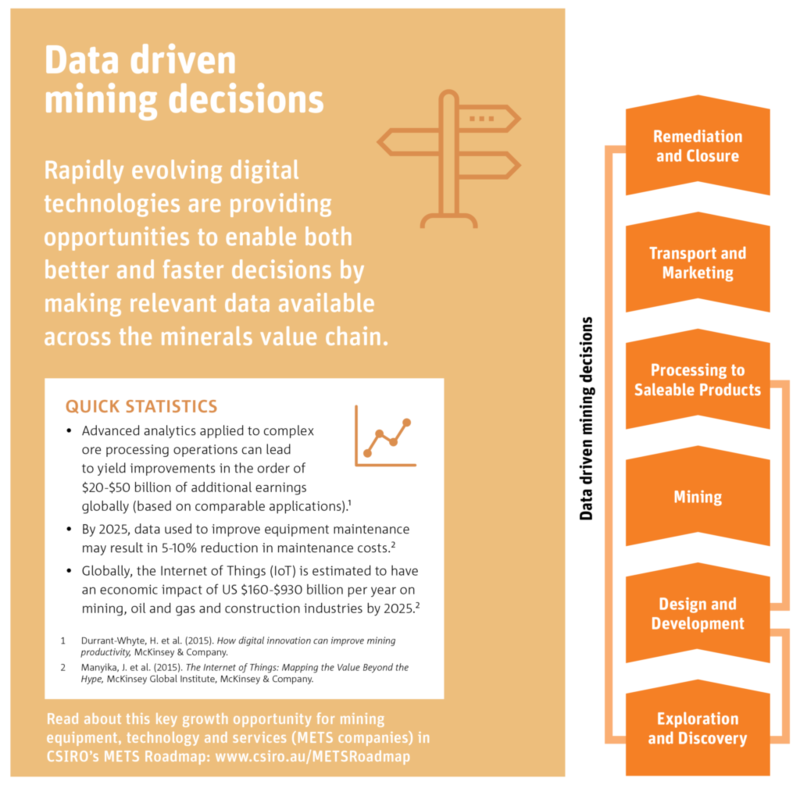 With improved safety, increased productivity, enhanced efficiency and better environmental performance arising from new technologies, mining companies are eager to embrace the benefits of data and the internet of things. Globally the internet of things is estimated to have an economic impact of US$160-930 billion per year on mining, oil and gas and construction industries. Real-time sensing, data integration and interrogation, interoperability, artificial intelligence and automation are all buzzwords in today’s mining industry that offer an opportunity to transform the industry through integration, speed and re-invention. A key part of this digital transformation is the ability to provide accurate, relevant and useful data on resources and mining. New sensor and data technologies are helping big and small miners to make better and faster decisions. Faster decisions that improve productivity and safety. Better decisions that improve environmental impacts and social acceptance. 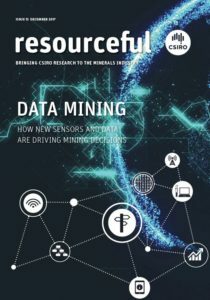 In our latest issue of resourceful, we showcase how data is driving decision-making across the minerals value chain. Taking its name from the world-famous Rosetta Stone, which provided the clues to deciphering ancient Egyptian hieroglyphics, our Rosetta software is able to decipher different analytical data sources to create a complete picture of an orebody. Our Rosetta Stone for ore is giving exploration and mining companies the ability to predict ore quality and evaluate and plan for mining and processing more accurately than ever before. Our Lab-at-Rig brings mineral analysis to the exploration drill site, enabling million dollar decisions to be made in minutes. Meanwhile, advanced magnetic resonance technology is enabling bulk ore sorting on a conveyor for copper and iron miners, offering a step change in productivity. A new autonomous system using sensor data and computer modelling is helping mine managers to forecast evaporation rates in legacy pit lakes on disused mine-sites, making it possible to effectively manage water resources remotely. We also show how community sentiment data gathered using a science-based solution is helping big miners understand and elevate their social performance. Our Reflexivity solution helps companies better understand community issues and how to address them, in order to build greater trust and negotiate a pathway to a social licence to operate. 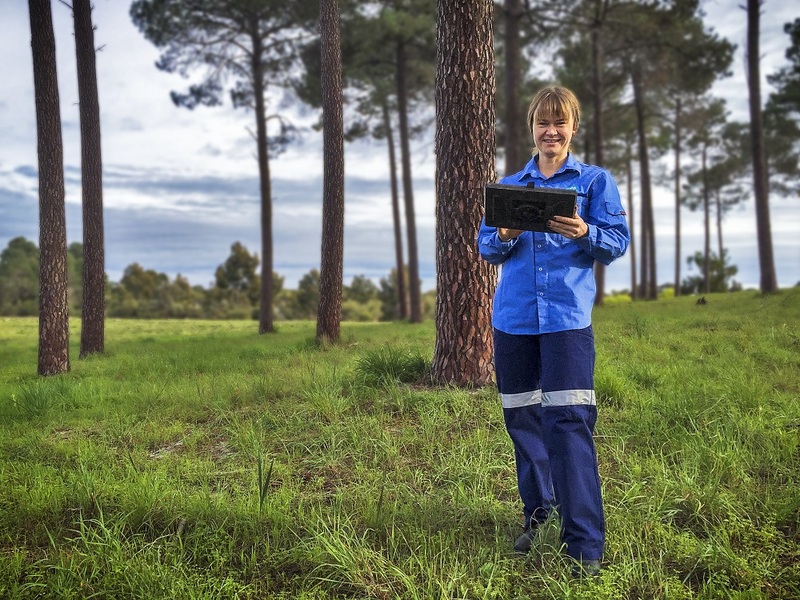 Our latest edition of resourceful dives into digital transformation in the resources sector.